It used to be the battle of the heavyweights, now the Ford-Holden battle is one of survival. Which is best equipped for the fight? Old heavyweight boxers aren’t renowned for their ability to pick the perfect moment to retire. Time and again they lumber back into the ring looking for one last payday, or a final shot at glory. Instead, all they end up with is one shot to the head too many and the nickname “Mumbles”. It’s a bit like the large car segment, where a couple of legendary pugilists are in the twilight of their respective careers. Holden’s Commodore and Ford’s Falcon still dutifully shuffle into the ring for the monthly sales war, but of late have been taking fearful punishment from younger, smaller rivals. They might still be able to throw a mean left hook with their family-sized space and long-legged touring ability, but the body shots are coming thick and fast from compact SUVs, medium cars and even small cars that are newer, more economical, less cumbersome and easier to live with. In spite of mounting evidence suggesting the cauliflower-eared pair are getting wobbly on their feet, Ford and Holden continue to pump time and resources into the models that still form the backbone of their Australian operations. The Commodore was Australia’s best-selling car for 15 consecutive years until last year, when it was finally knocked off by the Mazda3 small car. The Falcon’s slide has been significantly worse, from a one-time challenger to the Commodore’s dominance to Australia’s ninth-best-selling car in 2011. So are the fundamentals of these cars really so uncompetitive? 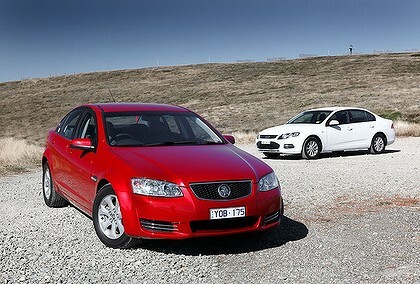 Drive picked up a Falcon XT and a Commodore Omega, the entry level models that comprise the majority of fleet sales, and set off on an 1100km, three-day road trip. We had two aims in mind – the first, to find out whether their fuel efficiency, comfort, handling and general liveability stacks up to more popular cars. The second, to divine which of the locally-built duo is the better mousetrap. Three hours immersed in semi-gridlocked city traffic on the morning of day one offers plenty of time to acquaint ourselves with these recently updated price leaders. The first thing we notice is these so-called base models are no longer the stripped-out, utilitarian affairs they once were. Both cars offer the ability to connect your phone into the car’s audio system via a Bluetooth connection, and in similar fashion they can even wirelessly stream music from your phone. The Falcon can also display the track information on the central screen though, but the Commodore counters with an on-board hard drive into which you can “rip” - or copy - entire CDs to form your own musical library. The Falcon XT even scores standard reverse parking sensors including a proximity display projected onto the main screen – something that until about five years ago was only available on high-end prestige cars as an expensive option. Both cars also have dusk-sensing automatic headlights and one-touch indicators that give a measured three flashes for easier lane changes. Each also has a comprehensive trip computer showing information such as fuel consumption – both instant and average – and range to empty. Both can also display a digital speedo, although only the Falcon’s display can be customised to show two selected information fields. The Falcon’s steering wheel-mounted buttons don’t illuminate at night, though, while the base model Commodore gets the same one-spec fits-all centre screen as more expensive models. That’s a bonus in terms of its upmarket display quality but also means the “nav” and “map” buttons don’t do anything when pressed – except inform you that don’t, in fact, have sat-nav. Despite offering big, comfy chairs up front and plenty of small-item and drinks storage, they’re also looking a bit dowdy in terms of design inspiration. The Falcon’s interior has been around for the better part of a decade while the Commodore’s harks back to 2006. A morning in Melbourne’s bustling CBD and an afternoon circumnavigating the city’s outer suburban sprawl fails to drive a wedge between the two. They’re surprisingly agile, weaving through heavy traffic as though born to do it. For such amply-sized objects they offer great views in all directions, although at one stage we lost sight of a pedestrian behind the Commodore’s thick-set windscreen pillar. The Falcon’s reversing sensors proved a godsend in tight car parks. The Falcon also proves the more adept at soaking up low-speed hits from potholes and lane markers during our afternoon tour of the suburbs. It has a softer, more supple feel to its suspension and a more substantial feel to its steering. The rival Commodore feels a little flightier in this environment, skipping across low-speed bumps rather than soaking them up. Meatier steering comes to the fore in corners though, where the Holden’s tauter set-up feels a few degrees sharper. Even before we hit the open road it’s already clear the Falcon’s bigger donk and superior power and torque figures are going to factor substantially into deliberations. An acceleration test underlines its advantage, showing the Ford sprints from a standing start to 100km/h in 7.2 seconds, more than a second quicker than the Holden (8.3 sec). Undulating hills around Melbourne’s northern outskirts quickly demonstrate the Commodore’s relative lack of flexibility, with the smaller 3.0-litre V6 abruptly downshifting in the hunt for more shove where the Falcon bullocks on without a murmur. There’s little to separate the pair on a long highway run down to Bairnsdale, where the Great Alpine Road begins. Both are respectably hushed inside the cabin at the 110km/h speed limit and each affords occupants a decent view of the passing countryside. The Falcon’s plusher seats come to the fore here, providing longer-term comfort than the Commodore’s firmer pews. As we begin the winding ascent to Victoria’s alpine country, the Commodore needs to be pushed to keep its smaller powerplant on the boil, ceding a significant advantage in driveability to its Blue Oval rival. The Holden wouldn’t be bested in the handling stakes, though, with the sharper steering and tauter ride we’d earlier noted making it the place to be as corners continue to tighten. The Ford can wallow somewhat in this environment and without the same seat-of-the-pants connection to the road as the Commodore, its steering needs more constant correction. It also appears the more prone to tyre squeal in heavy cornering, its 16-inch Goodyear Excellence hoops chattering incessantly as we descend the tight, winding road from the summit of Mount Hotham. The Commodore, shod in 16-inch Bridgestone Turanza rubber, shifts about less although larger corrugations tend to be both felt and heard more keenly. The Ford does a far better job of damping the vibration of such intrusions, although both can clunk inelegantly on encountering a pothole under braking. Rising fuel costs appear to be a major part of the reason these two sluggers are rapidly losing top billing in the sales popularity contest, but based on our test they shouldn’t be discounted as the fuel pigs they’re often painted to be. The Falcon all-but matched its official fuel figure (9.9 litres per 100km) with an overall average of 9.97L/100km over our 1100km, three-day drive. It was thirstier than the Commodore in city and suburban driving (11.7L versus 11.1L) and also in a long, winding mountain ascent and descent (10.1L versus 9.7L) but significantly more economical on a long, lazy run down the Hume Highway (8.3L versus 9.2L). The Commodore’s average of 9.85L/100km over the entire trip was a fraction lower than the Falcon, but comfortably above its official average of 8.9L. Having said that, a Toyota Camry Hybrid on the same trip returned an average of 6.65L/100km, showing it’s possible for a family-size car to use technology to generate significant fuel savings, even if trades in a bit of driving enjoyment in the process. But these are cars that are not only designed to eat up the kilometres, they’re also family transportation with the ability to accommodate up to five bodies and plenty of gear. The Holden immediately impresses with a rear seat that offers more knee room and head space. The seats themselves are more supportive than the Falcon’s, although not quite so well padded. Both have rear-facing air vents, but neither gets a flip-down centre armrest and the rear headrests are fixed. The Falcon impresses with seats that flip forward to create a decent gap through to the boot, large enough to accommodate a couple of surfboards. The Commodore, by contrast, makes do with a much smaller aperture better suited to a pair of snow skis. The Ford gains a slightly larger boot space (535 litres versus 496) but a deep, square depression in the centre of the boot floor makes it a difficult space to pack large suitcases or boxes into. Under the floor in our test cars was a space-saver spare in the Falcon and a full-size spare in the Commodore (a no-cost option). Is this pair of punch-drunk old stagers still relevant in a vastly more modern world? Holden and Ford have done a great job of applying cosmetic and equipment upgrades, but the final round could be looming, particularly for the Falcon as sales continue to plunge. Medium-size cars such as Ford’s Mondeo and the Toyota Camry, and even small cars such as Holden’s Cruze, are spacious enough for families and bring with them newer, more modern thinking. Even the fleet sales that have underpinned Commodore’s record-breaking 15-year streak as Australia’s favourite cars are beginning to wane in favour of smaller, more city-friendly cars and versatile SUVs. The Commodore Omega and Falcon XT remain highly competitive in packaging and dynamic terms but still carry a price premium and in many cases a fuel use penalty over cheaper, newer cars with similar family attributes. Does either deliver a knockout punch in this one-on-one stoush? The fact that they’ve been benchmarked exhaustively against one another for decades means they’re remarkably similar in many respects. The Commodore is the choice if you’re more about the journey than the destination, although its relative lack of power has the potential to impact on driving enjoyment. It’s slightly more economical, though, and has a more spacious rear seat. The Falcon, meanwhile, is a comfortable and capable tourer, with plusher seats, better bump absorption and a more relaxed demeanour courtesy of its torquier engine. Its standard rear parking sensors are a great addition for a base model, as is its customisable trip computer. The Falcon is currently $2755 cheaper but feels slightly more luxurious than the Commodore and is by a small degree the more versatile performer across the wide variety of driving conditions we encountered. Its larger engine is a more willing accomplice, and without significant fuel penalty against the Holden. It’s not a big advantage, but it’s enough to deliver a narrow points decision to the Falcon. Oh god that commodore is ugly. We can thank Fords complete abandonment of marketing for the platform for the death spiral of Falcon sales. Thanks a lot!!! Keenly awaiting a comparison of the Ecoboost Falcon and it's rivals!! Not so keenly awaiting the ignorance of opportunity from Ford. Thats the thing that upsets me the most about the falcon going under; it's the better car. As far as the 6 goes, anyway. The Commodore has its ups, don't get me wrong. I don't want to see either of them die. Its such a shame to see the Falcon lagging in the sales. The reason why Ford Aus stuck with the I6 is because of the State and federal Govts bailing out Ford to keep the local engine production plant running. Ford Oz has no support what so ever from Ford USA !! !